Abstract. By extracting bound water from the soil and lifting it to the canopy, root systems of vegetation perform work. Here we describe how root water uptake can be evaluated thermodynamically and demonstrate that this evaluation provides additional insights into the factors that impede root water uptake. We derive an expression that relates the energy export at the base of the root system to a sum of terms that reflect all fluxes and storage changes along the flow path in thermodynamic terms. We illustrate this thermodynamic formulation using an idealized setup of scenarios with a simple model. In these scenarios, we demonstrate why heterogeneity in soil water distribution and rooting properties affect the impediment of water flow even though the mean soil water content and rooting properties are the same across the scenarios. 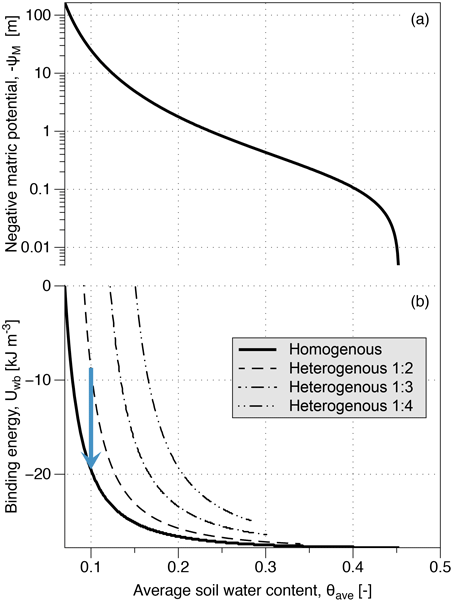 The effects of heterogeneity can clearly be identified in the thermodynamics of the system in terms of differences in dissipative losses and hydraulic energy, resulting in an earlier start of water limitation in the drying cycle. 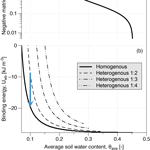 We conclude that this thermodynamic evaluation of root water uptake conveniently provides insights into the impediments of different processes along the entire flow path, which goes beyond resistances and also accounts for the role of heterogeneity in soil water distribution. How to cite: Hildebrandt, A., Kleidon, A., and Bechmann, M.: A thermodynamic formulation of root water uptake, Hydrol. Earth Syst. Sci., 20, 3441-3454, https://doi.org/10.5194/hess-20-3441-2016, 2016. This theoretical paper describes the energy fluxes and dissipation along the flow paths involved in root water uptake, an approach that is rarely taken. We show that this provides useful additional insights for understanding the biotic and abiotic impediments to root water uptake. This approach shall be applied to explore efficient water uptake strategies and help locate the limiting processes in the complex soil–plant–atmosphere system.